Open to public, reservations required for parties of 9 or more. Inglenook is a winery that produces estate bottled wines in Rutherford, California, in the Napa Valley. The winery was founded in 1879 by a Finnish Sea Captain Gustave Niebaum. Niebaum died in 1908 and the winery was shut down during Prohibition. Upon repeal of Prohibition, Niebaum's widow Suzanne Niebaum reopened Inglenook and brought in a viticulturist and an enologist to upgrade the winemaking system. Niebaum's great-nephew John Daniel Jr. took over operations in 1939 and by the 1940s Inglenook's wines once were again declared by many to be the best in the Valley. More than 1,500 acres (610 ha) of the property were acquired by Francis Ford Coppola in 1975 with profits of his film, The Godfather. The brand name and the remaining 94 acres (38 ha), including the historic winery, were bought by Heublein, Inc., which began making lower quality wines produced elsewhere under the Inglenook label. Heublin was later bought by RJR Nabisco, then sold to Grand Metropolitan in 1987. Heublein sold the winery to the Canandaigua Wine Company (which later became Constellation Brands) in 1994. Canandaigua consolidated winemaking operations elsewhere and sold the remaining acreage and winery to Coppola in 1995. 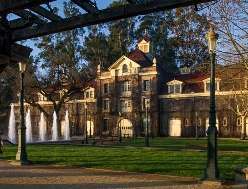 In the French tradition, Coppola combined his name with the original owner, naming the facility Niebaum-Coppola Estate Winery. Coppola later renamed it the Rubicon Estate Winery. In January 2008, The Wine Group announced that it would purchase Almaden Vineyards, the Inglenook label and the Paul Masson Winery in Madera, California from Constellation Brands for $134 million in cash. On April 11, 2011, Francis Ford Coppola acquired the iconic Inglenook trademark, paying more, he said, than he had for the entire estate and announced that the estate would once again be known by its historic name, Inglenook. ↑ John Mariani (August 2, 2006). "Francis Coppola Revamps His Wine Business Again". Bloomberg. Retrieved 2007-11-13. ↑ Dan Berger (November 12, 2007). "How Corporate Consolidation of the Wine Business Is Affecting What's in the Bottle". Appellation America. Retrieved 2007-11-13. ↑ "Wine brands are bought". New York Times. June 24, 1994. Retrieved 2007-11-13. ↑ Suzanne Hamlin (July 10, 1996). "A Director's Vision for Celebrating Food, Wine and Film". New York Times. Retrieved 2007-11-13. ↑ James Laube (April 11, 2011). "Coppola Reunites Inglenook Name with Its Vineyards". Wine Spectator. Retrieved 2011-12-05.